If I were to write one page for every experience I’d end up paying big big pixel taxes, which is why I’ve decided to upload blogs separately and link to them from each relevant page. But a few places deserve a page of their own, and one such place is St Catherine’s, Sinai. Even Fano isn’t getting its own page, well, not yet anyway. Why St Catherine’s? Well, I succumbed to the change in my internal energy when the idea entered my head. Put simply, I followed a whim. I had the pleasure of spending a few days in St Catherine’s earlier in 2008, just as the weather was getting hot. Clearly it’s a place packed with literal significance, whether religious or historical, but the attraction goes further than this. It’s one of those places with the type of special energy you don’t get elsewhere. The journey down could be a few pages in itself but for now let’s just say it was eventful right to the very last, when the driver made me pay extra for his mate who he’d stopped to pick up (and, who we’d had to wait half an hour for). Infinitely preferable however to skidding off the road and bursting into flames, as Egyptian Sinai-bound coaches are so prone to doing. Instead, the coach I travelled on was barely capable of skidding on the road, let alone off it. Rickety but satisfying the essential requirements of reaching B with the same number of components and passengers as it left A with. Eventually. St Catherine’s is not very big, but people don’t go there to see the town. The main draws are the mountain, and the monastery. 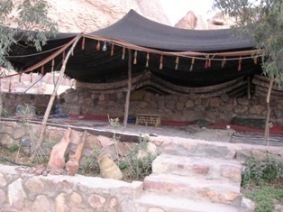 There’s also a great Bedouin camp called Fox Camp and a Bedouin school which teaches traditional skills dating back millennia (see the link below). I wanted to stay and learn some, it just wasn’t practical. 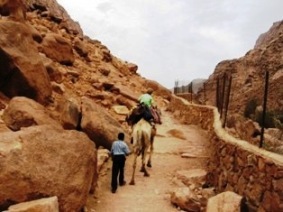 Our trip was organised around the dawn ascent of Mount Sinai. The previous day was spent training to ride camels properly and it was in this way that we climbed most of the mountain, as far as a traditional Bedouin camp where we stayed the night. By the time we arrived we were starving, and the meal they served was not only vegan but plentiful, and under the clear sky away from the Cairo noise it was probably the best meal I’ve ever eaten. Next day we set off for the summit and my ego soon took over compelling me to show that I can run up mountains quicker than everybody else, so I gave the guide the slip and shot up hoping to have the summit to myself... at 5 o’clock in the morning it didn’t seem too much to ask (in spite of the hoardes of people on the climb) but when I got there it was like a Bishkek marshrutka. I could barely move. There must have been two hundred people there, some praying, some singing, some sleeping, others eating, others with cameras poised in case, I guess, anything happened. After dawn the crowd thinned somewhat leaving us free to take up a vantage point from where I took this photo (top right). Our descent was interesting and although down a designated path still quite challenging. But from half way down we could see St Catherine’s monastery and on our arrival we were disappointed that it was closed. It saves me thinking what to write about it, but I can’t help feeling that’s only a scant consolation. 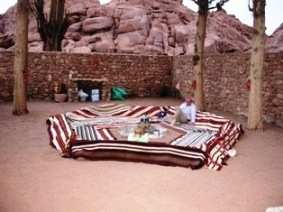 The organiser of the trip had retired from teaching and set up a small tour company in St Catherine’s. From his point of view it’s a great business venture with potential, from yours it’s a magical weekend in a very powerful place, check it out and drop by.